Breast Implant Guide: Gummy Bear Implant, Tear-shaped Implant, Smooth Implant – HELP!!!! Many patients seeking breast augmentation in orange county ask me about different types of implants available. Most commonly asked question is “Do you use gummy bear implant?” The answer is yes and no! Let me clarify. The original gummy bear implant (style 410 Allergan), was developed several years ago. It is a tear-shaped implant, and at the time, had the most cohesive silicone gel available. Currently, all silicone implants are highly cohesive…in other words, all implants are “gummy bear” in terms of silicone gel consistency. Since I brought up tear-shaped implants, let’s discuss them. Tear-shaped implants are also called anatomical shaped implants, because they are flatter on the top and fuller on the bottom (like a tear). The surface of these implants are textured, in order to minimiz e rotation of the implant. As one can see, one of the potential downside of using these implants is rotation and change in the shape of the breast. These implants are also more expensive compared to smooth, round implants. Over the past two years, three studies have shown no difference between using these implants compared to smooth, round implants. Neither patients nor plastic surgeons were able to identify the correct implant based on photos. Furthermore, over the past five years, there has been increasing evidence linking textured implants to a very rare form of cancer called ALCL (Anaplastic Large Cell Lymphoma). This rare form of cancer has only been linked with textured implants. For the average cosmetic patient seeking breast augmentation, I do not see any benefit in using this implant. 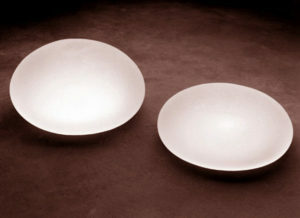 Most plastic surgeons use smooth, round implants. These implants, when kept upright, do become somewhat anatomical, because the weight of the implants shifts the implant towards the lower pole. This implant is less expensive than anatomical ones, does not have the concern regarding rotation, and, so far, has not been linked to ALCL. The best result, regardless of implant selection, is to have realistic expectation, to pick an implant size which can comfortably fit within the dimensions of the breast width and height, and to follow post-operative instructions and follow up appointments. Michael A. Jazayeri, M.D. is a board certified plastic surgeon with over 18 years of experience. His offices are located in Santa Ana and Newport Beach, California, serving both North and South Orange County. To schedule a complimentary consultation, please call 714-834-0101. PreviousPrevious post:Advantages of Fat Transfer in Cosmetic SurgeryNextNext post:What will be my final cup size after breast augmentation?